Key information from a U.S. Predator drone helped end Tuesday night's siege on the Hotel Inter-Continental in Kabul, Afghanistan. Washington (CNN) -- A U.S. Predator drone flew over a Kabul, Afghanistan, hotel during Tuesday night's insurgent attack, providing critical video of the attackers as the situation unfolded, two coalition military officials said Wednesday. Information from the drone helped Afghan and coalition forces plan and conduct counterstrikes in the Hotel Inter-Continental attack, officials said. 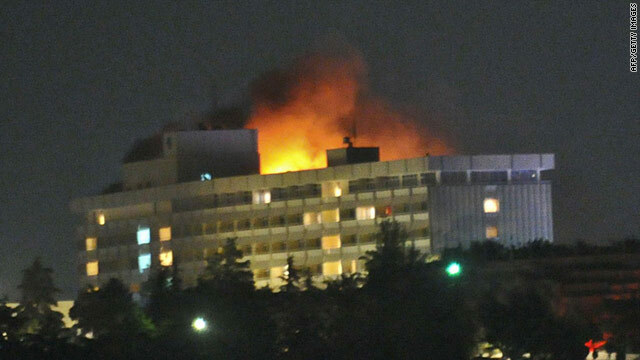 In addition, a U.S. Blackhawk helicopter fired on up to six insurgents on the hotel roof, the officials said. Can U.S. find success in Afghanistan? The helicopter carried snipers from the the NATO-led International Security Assistance Force, the officials said. The snipers were not with the U.S. military, but the NATO-led force declined to specify their nationality because the snipers are special forces and their country views their identities a sensitive matter. A NATO-led special forces team was also at the hotel to advise Afghan security forces, the officials said. Coalition military officials said that Afghan security forces took the lead in dealing with the attack. They said that senior Afghan security officials quickly arrived on the scene, including the interior minister and Kabul's police chief. At least 10 people were killed in the brazen, carefully orchestrated attack that raged into the early hours of Wednesday, officials said. The Taliban claimed responsibility for the siege, and authorities said eight militants died as well.